Imagine for a moment sitting at the kitchen table, steaming coffee in hand. The sun is streaming in the windows, bacon is popping in the pan, and Rover drops the paper at your feet. A brilliant Saturday morning by any measure, but today is extra special. Now you’re retired! When you open the paper to the front page you notice that something is strange. First, the pictures are moving as though there is a movie embedded in the page instead of a picture. The text is in a strange font, and is so clear that it almost jumps from page to eye. When you start to scan the first article, you are startled to discover that a woman’s voice seems to be reading the words directly into your mind. Your eyes dart to the top of the page, searching for the publishing date of the paper: August 1, 2045. Your gut falls, pulse is pounding; deep breath, calm yourself. A few minutes later, coffee and bacon forgotten, you are flipping urgently through the paper – maybe it will disappear just as quickly as it appeared! Strange names, strange places, strange devices; what wonders! Then you are in the business section. Numbers scroll across the top of the paper: every major market is listed and some new ones, along with their current prices. A bell goes off in your head, and a smile paints its way across your face. You work the math. You’re 63 years old today. Your retirement plan was engineered to last you and your spouse 32 years until you turn 95 in the year 2045. How fortuitous! You scan the business pages, but can’t find any individual stock listings, just closing values for major markets and asset classes. Quickly, you compare the prices listed for indexes in the paper to the most recent closing prices until you find the market with the best returns over the next 32 years. You discover that the best market will deliver returns of 8% per year. Retirement Nirvana is just a few clicks away with your trusty Excel spreadsheet. No more anxiety, no more sleepless nights. You’re set. While you now have information about average returns for the best market over the next 32 years, you have no idea what path that market will take to get there. In your minds’ eye, it looks like the trajectory in Chart 1; a beautiful arcing growth curve from point A today to point B 32 years from now. But in reality, the paths that the index might take to achieve that level are limitless. For example, the index might surge in the first few years and then move sideways for the last couple of decades, like the red line in Chart 2. Or it might move sideways for the first three decades, and deliver all the returns in the final two years, like the green line. I know what you’re thinking: Why does it matter in what sequence the returns are generated if we know exactly where the index will end up? Why do I care if returns come early or late, or are spread evenly through time? These are great questions. Indeed, if we were to invest a lump sum in the index today and leave it there for 32 years it would not matter – at least mathematically – which path the index traveled to get from A to B. Unfortunately, most retirees aren’t in that situation. Rather, most people expect to draw a steady income from their portfolio, withdrawing monthly, quarterly or annually an amount that keeps them in a certain lifestyle, adjusted each year for inflation. As we will see, this subtle change in objective can have a profound impact on financial outcomes. Let’s zoom in for a moment on Nick and Nancy, both 63. They are about to embark on the great retirement adventure. Through sacrifice, wisdom, perseverance – and some luck – the couple has accumulated $3,000,000 in savings over Nick’s almost 4 decades as a corporate lawyer. Nancy is pretty good with a spreadsheet so, with the help of their accountant, she created one to determine how much pre-tax income they can draw each year from their combined nest egg. Their analysis yielded the results depicted in Chart 3. The red bars in Chart 3 represent the income that Nick and Nancy expect to draw each year from their portfolio, adjusted for inflation. You can see that in the year after retirement they expect to draw about $180,000, and this amount scales by 3% per year, to account for expected inflation. The blue line describes the evolution of Nick and Nancy’s wealth after accounting for investment growth at 8%, and their annual withdrawals. Note that their total wealth seems to peak at around age 75 near $3.5 million before tapering off aggressively toward their estimated age of mortality: 95. So, from our future newspaper Nick and Nancy know that they are going to invest in a portfolio that delivers 8% per year, on average, over their 32 year retirement horizon. What they don’t know is the sequence in which those returns will materialize. In the next section we will demonstrate how this seemingly benign missing piece to the puzzle will decide Nick and Nancy’s retirement fate. For the sake of illustration, let’s assume that the best index over Nick’s and Nancy’s investment horizon is the Dow Jones Industrial Average. Nick and Nancy confidently withdraw an income each month to fulfill their lifestyle expectations, and all of their money is invested in this index. Let’s also assume that the Dow delivers exactly the same returns over the next 32 years that it delivered over the years 1966 through 1997. 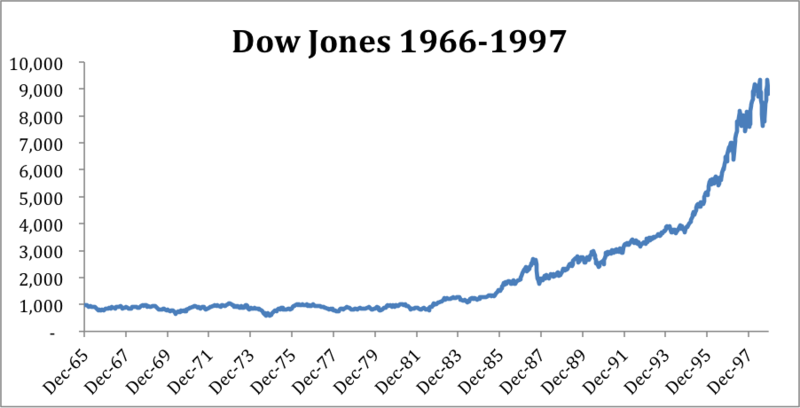 This period was chosen because the returns to the Dow over the period were exactly 8% (or near enough for government work), and because it captured a long sideways market in the 1970s as well as a long powerful bull market from 1981 through the late 1990s. Chart 4. plots the price performance of the Dow over this period. Again, note that the average return to the Dow over this period is 8% per year. However, if you look closely you will see that the returns are not evenly spaced over time. Rather, from 1966 through 1982 there are essentially no returns, as the index began the period at 1000 and ended the period at the same level. 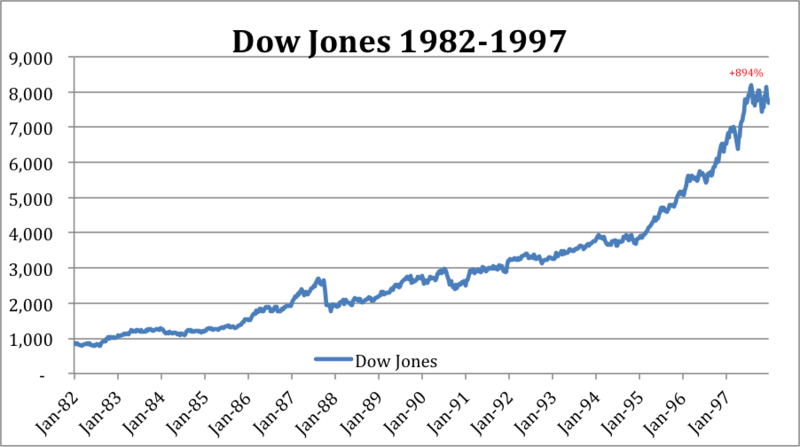 Then, from 1982 through 1997 the Dow grew at over 15% per year taking the index from 1000 to about 8000. Charts 5 and 6 zoom in to provide a better perspective on these two very different market regimes. In our first instance, let’s take the straightforward example where Nick and Nancy experience exactly the same returns, in exactly the same order, as the Dow index delivered over the 32 years from 1966 to 1997. Remember, in the early years Nancy and Nick’s portfolio is large relative to the amount of their annual withdrawals, while in the back half of their retirement horizon, after they’ve spent many years drawing down income, the portfolio is relative small. Obviously the portfolio is more vulnerable to poor returns when the portfolio is large than it is when the portfolio is small. In this example where the markets play out as they actually did historically, market growth would materialize in a manner that somewhat resembles the green line in Chart 2 above: sideways early on with a late surge. Chart 7 shows the trajectory of their retirement wealth given this market return trajectory, including withdrawals and growth. Remember, Nick and Nancy knew for certain that they would achieve 8% average compounded returns over the full duration of their retirement horizon. However, in this first example, where the poor returns come early in the retirement horizon, the couple is completely broke over 15 years before their expected age of mortality. That is, Nick and Nancy must endure their remaining 5, 10 or 15 years in retirement on CPP (social security) and old age social subsidies alone. A pretty dire outcome. For our second example, we will mix things up. 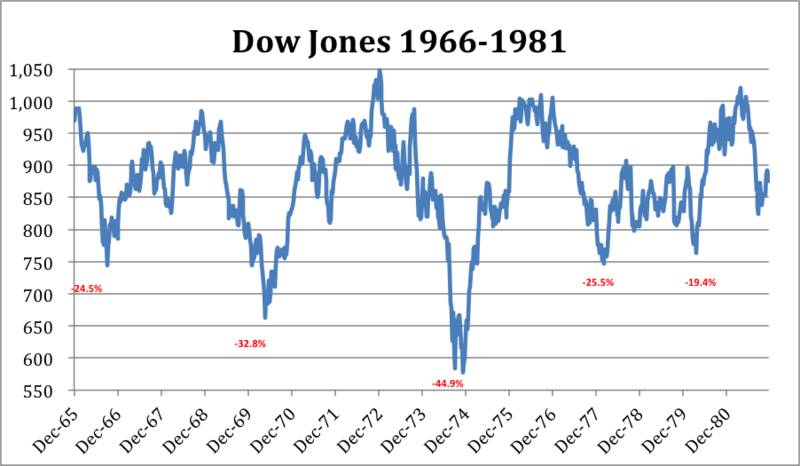 Rather than experiencing the long, volatile sideways market from 1966 to 1981 first, followed by the strongly surging market from 1982 to 1997 later, we will reverse the order. In this case, imagine a situation where Nick and Nancy experience the long bull market from 1982 to 1997 in the early part of their retirement period when their nest egg is very large, and then experience the 16 years of poor sideways markets in the latter half. 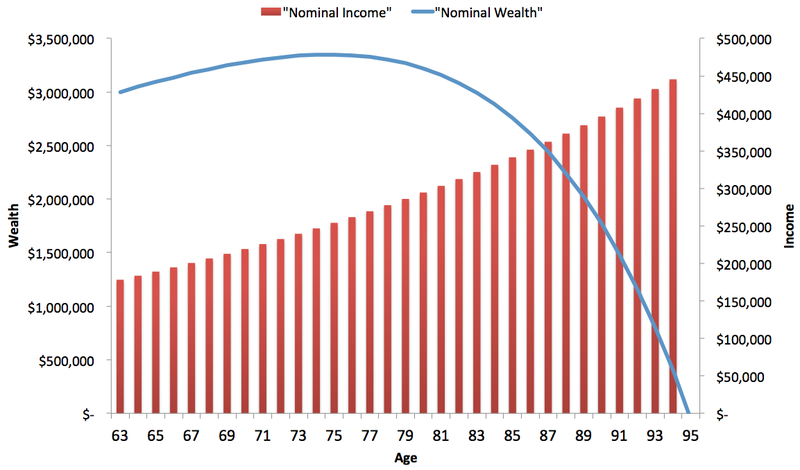 Chart 8 shows Nick’s and Nancy’s retirement trajectory under these new assumptions. Note how this this chart looks much more like Chart 3., which was the retirement model that Nancy created when she analyzed their prospective retirement trajectory. In this example, Nick and Nancy are able to withdraw their desired income each year, adjusted for inflation, and still end up with over $4 million in terminal wealth. Now we see why Albert Einstein allegedly claimed that compound growth is the most powerful force in the universe. It is critical to remember that the Dow Jones Industrial Average delivered average returns of 8% per year in both examples above. 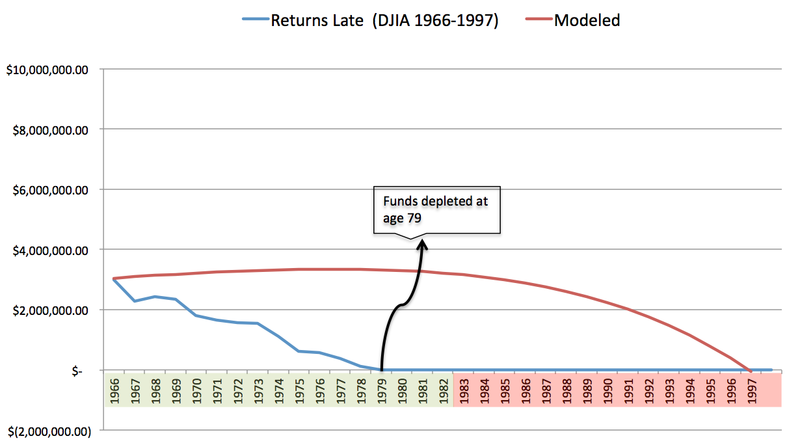 With no cash flows going in or out of the portfolio, the order of returns is completely inconsequential. It doesn’t matter whether returns come early or late; the Dow still ends in exactly the same spot. However, when we introduce cash flows into the equation, things change dramatically. We saw that, with exactly the same withdrawals, and exactly the same long-term average market returns, Nick and Nancy ended up in two dramatically different situations. On one hand they died with over $4 million in wealth for heirs, charity or other valued causes. On the other hand they were flat broke at age 79, fully 16 years earlier than expected. So what matters most to Nick and Nancy, the average return from the market, or the average growth of their portfolio? The average rate of return on a series of cash flows is referred to as the Internal Rate of Return. It is also referred to as the dollar weighted rate of return. We refer to the average dollar weighted rate of return that a person receives on his personal portfolio as his Individual Rate of Return, and it is the only rate of return that should matter to investors who are either saving money, or withdrawing money from their portfolio over time. Table 1. compares the average rate of return on the Dow Jones to the Individual Rates of Return that Nick and Nancy experienced in their portfolios in the two examples above. Note that the IRR from the model is less than 8% due to the way dollar weighted returns are calculated over time contrast to the 8% arithmetic return of the index. Table 1 clearly shows that an investor with the exact same savings and the exact same average market return can experience a +10% difference to actual realized portfolio growth, or Individual Rate of Return, simply due to luck. An investor who is lucky enough to experience strong market growth in the front half of their retirement horizon may experience double, triple, or better growth than an investor who is unlucky enough to have most of his strong returns come in his later retirement years. In the case of Nick and Nancy, a weak sequence of returns resulted in total depletion of their wealth after 16 years of retirement, while a strong sequence resulted in a $4 million legacy. Do you feel lucky, sir? Nick and Nancy discovered that it is not enough to know the long-term average returns that they can expect from their investment portfolio. It is also important to account for potentially adverse sequences of returns. For savers, it is problematic to invest in a portfolio with the potential to deliver high returns in early periods followed by low returns in later periods. 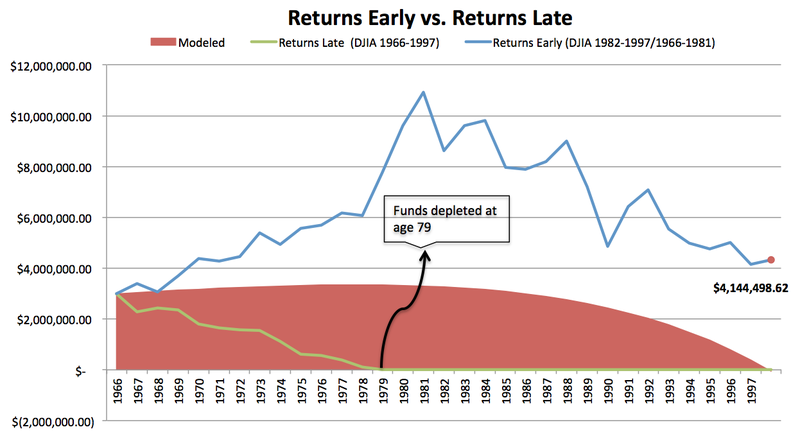 For retirees (and endowments and pensions) in a net withdrawal situation, sequence of returns is equally important. However, the situation is reversed, such that investors in withdrawal will be adversely affected if returns cluster later in the investment period, with lower near-term returns. For investors in traditional portfolios this sensitivity to the sequence of returns can be seriously problematic. That’s because both stocks and bonds are prone to periods of low, volatile returns that last many years or even decades. 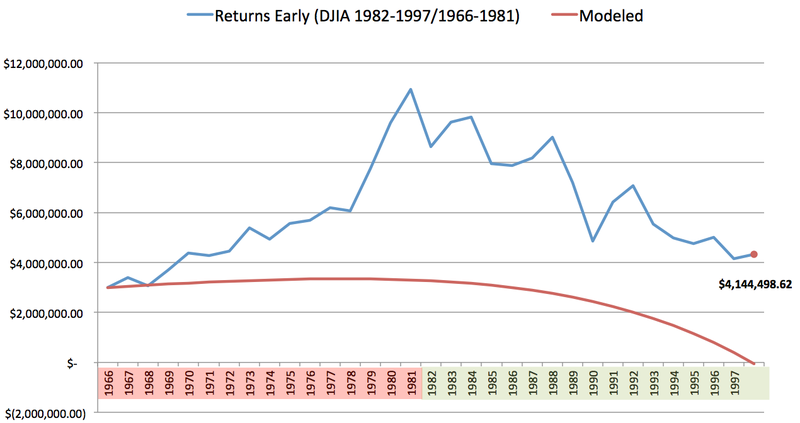 The following chart shows the long-term returns to the Dow Jones Industrial Average back to 1998. Note that periods of strong returns – coloured green in the chart – have lasted between 5 and 17 years, and delivered cumulative returns ranging from 150% to 1000%. 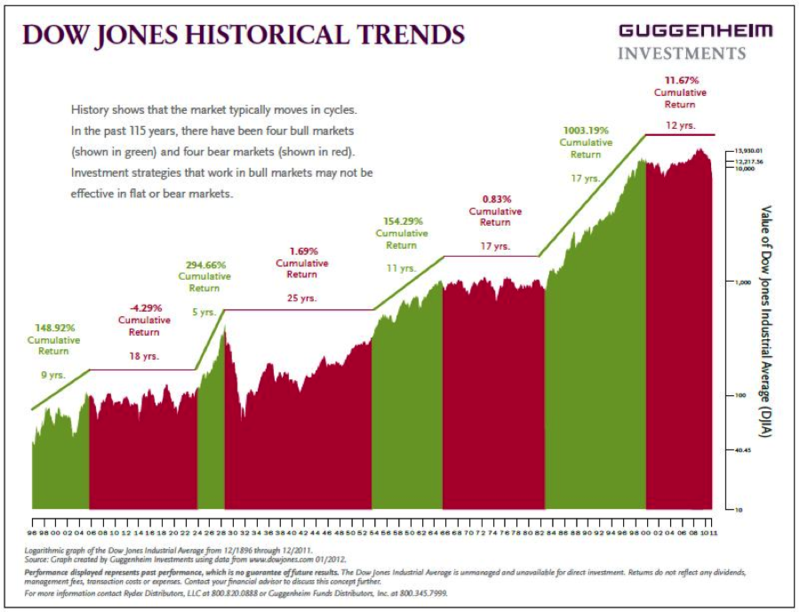 These green periods of long-term growth are invariably followed by red periods of low or negative returns that have lasted from 17 to 25 years historically, and delivered cumulative returns between -4% and 12% over their entire duration. Note that we are currently about 13 years into the most recent red sideways period. The question is, are we near the middle of the sideways period, or did we turn the corner in 2008, setting up for a new long-term growth cycle? The answer has profound implications for investors. Are we setting up for a decade of strong returns right now, which would prove to be a boon for recent retirees but unfortunate for young savers? Or will we experience another 5 or 10 years of sideways to set up for a long growth market a decade in our future? By actively managing portfolio risk and dynamically assembling diversified portfolios of global assets twice per month, our AAA process is engineered to minimize risks associated with sequence of returns. Instead, in simulations back to 1995 the AAA approach implies the potential for extremely stable returns regardless of market conditions. As a result, even under onerous assumptions, we believe a portfolio invested in AAA is much more likely to hit your financial targets than a traditional portfolio approach, especially given the poor prospects for stocks at this point in the market cycle.